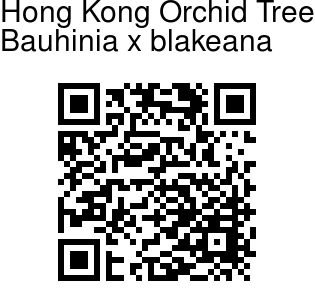 This tree is the official floral emblem of Hong Kong and it is widely cultivated in tropical regions. It is thought to be an accidental hybrid between B. purpurea and B. variegata. It was first discovered on the seashore in Hong Kong in 1908 and named after Sir Henry Blake, Governor of Hong Kong from 1898 to 1903. After the handing back of the colony to China, a special award was created to replace the British Imperial honours. The award is called the Grand Bauhinia Medal, or GBM for short. A small evergreen tree to around 7m tall. The bilobed leaves are dark green and shiny, with raised yellowish-green veins. Compared to other Bauhinias, the leaves of this one are huge, six to eight inches. The large, orchid-like flowers are rich magenta purple with paler veins, and the uppermost petal is darker towards the base. Flowers appear from February to November, with the peak flowering time in September to October. 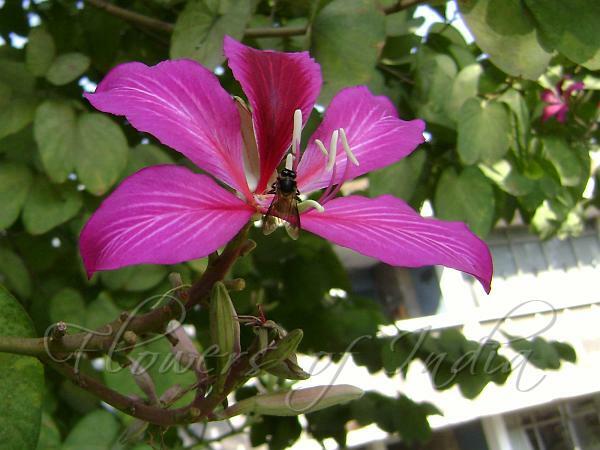 This bauhinia is sterile and rarely produces the large flat seed pods seen on other species.